An affordable laptop, but has Asus cut too many corners to keep the price down? The Asus V550CA-CJ106H has an unenviable task of balancing power and price, but it doesn't do too bad a job. There are some nice features, such as the generous 1TB of disk space included and the touchscreen, but there are also some trade-offs. 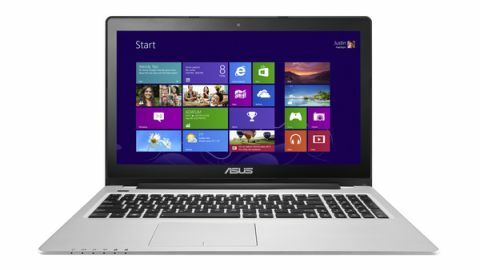 Mid-ranged laptops such as the Asus V550CA-CJ106H can sometimes be a mixed bag. They come with price tags that make it hard to overlook the sort of shortcomings you'd forgive a laptop £300 cheaper. And yet they still can't target the highest-end components for the best possible performance. Sometimes these laptops can get the balance right, such as the Samsung Series 9 NP900X3D, but more often than not they can end up being rather underwhelming, like the MSI CX61 0NF. So how does the Asus V550CA-CJ106H fare? Unlike the MSI CX61 0NF, which tries to appeal to gamers with a separate graphics card, the Asus V550CA-CJ106H is a much more straightforward device that's better suited to office work, internet browsing and casual games at home. It's got a decent set of specs, though as sometimes is the case with laptops of this price range, the desire to keep the price down has resulted in compromises to its innards that keep it from reaching its full potential. A good example of this is the Intel Core i7-3537U processor clocked at 2.50GHz. It's certainly no slouch, and it's always nice to see an i7 variant in a laptop of this price. But it uses Intel's older third- generation design, codenamed Ivy Bridge. These are fine chips, but Intel has since released its fourth-gen design, codenamed Haswell. Check out our review of the Intel Core i5-4670K for a better idea of how the newer generation of processor compares to the Ivy Bridge. The most important thing to note is that the new Haswell architecture has a few improvements, such as better integrated graphics and more power-efficient design. These ensure a longer battery life, which is essential for laptops such as the Asus V550CA-CJ106H. It's a shame, then, that Asus has skipped these enhancements for a cheaper processor, just to lower the price tag. If you're looking for a laptop with the latest technology then the Asus V550CA-CJ106H isn't going to be for you. For Haswell-toting laptops, you'll want to check out the Schenker XMG P703 or the Toshiba Satellite S50. Of course, you'll need to bear in mind that these laptops will be quite a bit more expensive than the Asus V550CA-CJ106H. However, if you want some solid tech for a palatable price and aren't too desperate for bleeding edge technology, then the Asus V550CA-CJ106H may be of interest.